Nicola joined the firm as personal assistant to Stephanie Power in 1999 having previously worked as a legal secretary to a partner in another law firm for four years. In 2000 she completed a Certificate in Legal Practical Procedures. 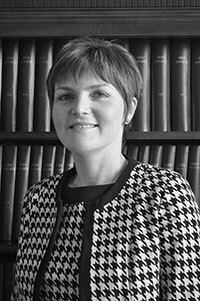 During her time with the firm Nicola has worked mainly in the area of civil litigation in the Circuit Court, High Court and Supreme Court and various tribunals. She is a member of the Irish Institute of Legal Executives. Nicola has experience in Plaintiff and Defendant work in areas including employers liability, public liability, property damage and other areas of personal injury. She has been involved in applications to the Injuries Board, Hepatitis C Tribunal, the Redress Board and the Employment Appeals Tribunal.